It’s never fun to see your smartphone slip out of your hand and head for the ground. There’s always that anxious moment when you pick it up and check for damage. If you’re lucky, you might get away with little more than a slight scratch, though there’s always the possibility of a cracked screen to ruin the day. 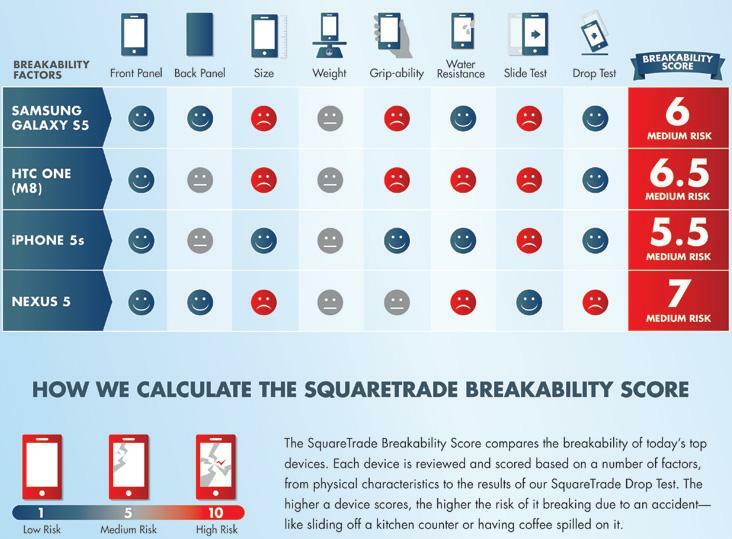 Gadget insurance firm SquareTrade recently put four of today’s leading smartphones through their paces in a durability test to see which device is likely to fare best with clumsy types. While not particularly scientific, it’s nevertheless interesting, if not a little fun, to see how particular models of smartphone stand up to these merciless drop/dunk challenges. In the video below you can see the four devices – the Galaxy S5, HTC One M8, Nexus 5, and iPhone 5S – acquaint themselves with a concrete floor after falling from about head height. After that, it’s bath time, with all four phones sent under water to see if they function during and after their unceremonious dunking. While the Nexus 5 came out of the drop test pretty badly, the other three received only minor damage. As for the water test, the Nexus 5 and HTC One M8 both emerged with video still playing, but no sound. The Galaxy S5 and iPhone 5S, on the other hand, continued to play both video and sound after coming out of the tub. According to SquareTrade’s findings, Samsung’s Galaxy S5 shows improvements in durability over the previous version, performing well in both the drop and dunk test. However, when evaluating a wider range of breakability factors (above), it was the iPhone that performed better than all the devices, the company found. Of course, if you stick a decent case on your handset, you’re going to drastically reduce the chance of damage in the event of a drop or dunk, so best choose your phone on the basis of price, features and reputation. If you’re interested in grabbing one of the latest high-end devices on the market, be sure to check out our comprehensive reviews of the Galaxy S5, HTC One M8, Nexus 5, and iPhone 5S.